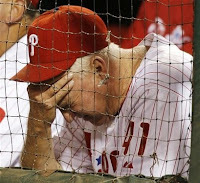 Well, folks...the Phillies are not helping themselves. 3.5 games behind the division leader. Tied with Houston (this year's "COLORADO ROCKIES!") 4 games behind the wild card leader. And the Phils have a 4-5 record so far in September. By comparison, the Mets are 6-2 this month...the Astros are 8-1 this month...the Brewers however are 3-7 this month, as they head to Philadelphia for a huge 4 game series starting Thursday the 11th. The 5th starter role in the pitching rotation is high up in the air right now. If I had to guess who it will be pitching Sunday's series finale, I'd say Adam Eaton. I don't think that "Jay" Happ has shown enough to get the start. Consider also that the Brewers thrive against lefty starters, and the Phillies already have 2 lefties starting games in this series. The only positive spin I can put on this forecast is that Eaton has never lost to the Brewers. Eaton's career record vs. Milwaukee is 2-0 with a 5.24 ERA in 6 starts. There is one more positive point to consider in all this 5th starter turmoil...this spot in the rotation needs only be used twice more, while, once Jamie "The Beast" Moyer resets the rotation order by starting on short rest to open the Brewers series, all the other starters will get 3 more starts each (except Myers, who pitched his first of three on the night I am writing this). The 5th spot can be skipped once, with the way the days off fall. Stats to ponder for Brewers series...Mike Cameron, Rickie Weeks, Prince Fielder, Corey Hart and Bill Hall are a combined 8-for-48 (.167 avg.) against Cole Hamels. JJ Hardy and Ryan Braun are a combined 6-for-15 (.400 avg.) and each has homered against Hamels. Hamels is scheduled to start game 2 of this series on Friday, facing lefty rookie Manny Parra.